Examining the process of abstraction that occurs whilst travelling, Mimi Tong’s site-specific installation explores the architectural and social landscapes of Marfa, Texas and New York City. In a new work that pushes the photographic medium towards physical architecture, Plateau Constructions draws from the arising juxtapositions found in newly observed and remembered impressions of urban and desert environments. In 2008, Tong travelled to the United States; firstly to Marfa, visiting the Chinati and Donald Judd Foundations to witness first-hand the enduring relationship between art, architecture and the land that was led by Donald Judd in the 1970s; and subsequently to New York, to explore the contrasting frenetic energy and movement found in such a high-density urban environment. Large format digital photomontages will be printed onto up to 30 meters of sheer fabric and be suspended across the gallery – creating fictional and playful interior and exterior images of the desert and urban American landscapes. Click here to visit Mimi Tong’s website. 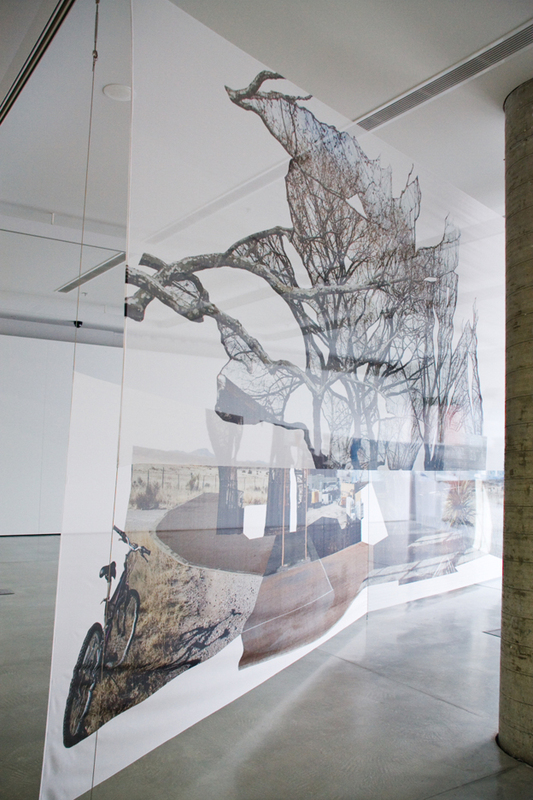 Image details: Mimi Tong, Plateau Constructions (detail) 2009, digital print on 100% silk organza, polyster boning, stainless steel wire, lag screws, turnbuckles, 2.8 x 11.5m. Courtesy the artist. Photography Silversalt. Plateau Constructions, supported by UTS in conjunction with the UTS City Campus Masterplan. This vision will present the university with a revitalised campus to match its position as a leading university of technology. Find out more about the Masterplan here. Pure silk organza digitally printed by Think Positive, Sydney. Download the Plateau Constructions press release here.